The main objective of this module of the Online Master / Doctorate in International Business (MIB) taught by EENI is to know the state of the World: trade blocs, trends in regional economic integration, emerging countries (BRICS), or African continent emergence. EENI Business School & HA University has developed a unique methodology of the State of the World analysis based on the concept of “Civilisations, Religions, and Regional Economic Integration.” Despite the globalisation phenomenon, business also tends to regionalisation. 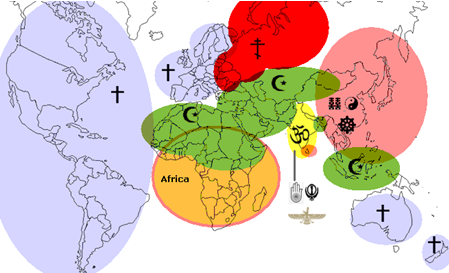 Analysing the role of civilisations - religions in a globalised world; we can identify eight major economic-religious areas, each area, can be formed by one or more distinct economic areas. 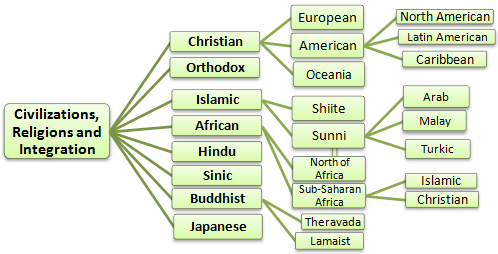 Islam (Sunni and Shiite) is the largest religion. In Islamic Civilisation, we can identify five different economic areas. 4- Economic Area of Hindu Civilisation. Hinduism is the largest religion; India is the central state and a BRICS country. 5- Economic Area of Sinic Civilisation. Buddhism, Confucianism, and Taoism are the main religions. China (BRICS country) is the Central State. The area of ​​influence of this civilisation includes Vietnam, South Korea, Taiwan, and Singapore. 6- Economic Area of Buddhist Civilisation, where Buddhism (Mahayana, Theravada) is the main religion. This economic area consists of Burma, Cambodia, Laos, Sri Lanka, and Thailand. In some countries, it coincides with Sinic Civilisation. 7- Economic Area of ​Orthodox Civilisation, where Orthodox Christianity is the main religion. Russia (BRICS country) is the Central State. This economic area includes Armenia, Belarus, Georgia, or Serbia. 8- Japanese Civilisation. Japan is the only country of this civilisation. It is important to note that due to the introductory character of this module, for each of these topics included (organisations, religions, Business People, Free Trade Agreements...) we will introduce only a summary of each of them, the in-depth analysis of each of them is done in other master and doctoral programs. For example, the South Asian Association for Regional Cooperation (SAARC) is an agreement between three civilisations - Buddhist, Hindu, and Islamic; the summary of the SAARC is approximately 3 pages, while the detailed analysis is 56 pages. This new approach to study economic relations between the civilisations will help the students to understand better the state of the World.